A mine-detection system worth $700 million can’t complete basic functions, according to the Pentagon’s weapon-testing office. The Remote Minehunting System, or RMS, had been in development for the past 16 years, was developed for littoral combat ships like the recently commissioned USS Milwaukee, and includes drone hunting technology. However, CNN reported that the Defense Department’s Office of Operational Test & Evaluation the technology was unable to identify and destroy underwater mines during tests. “The Navy has determined that the RMS’ total number of failures and periodicity of failures fall short of the design requirement for the system,” said Capt. Thurraya Kent, a Navy spokeswoman, told CNN. The Pentagon has slated a review for the program, designed for the USS Milwaukee, within the coming months. The mine-hunting drone, built by defense giant Lockheed Martin, was designed to be a key component of the Navy’s littoral combat ships. “Lockheed Martin continues to work closely with the U.S. Navy on the Remote Minehunting System mission package, which remains the most advanced method of mine-hunting available to the U.S. fleet,” said Joe Dougherty, a Lockheed Martin spokesman, told CNN. Meanwhile, according to the Associated Press, the USS Milwaukee broke down in Virginia over the weekend during its trip from California. 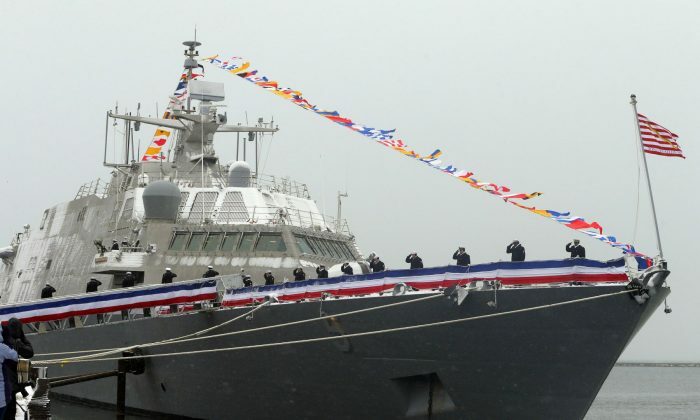 The USS Milwaukee, the littoral combat ship that commissioned in November, had to be towed more than 40 nautical miles to Joint Expeditionary Base Little Creek, AP reported. The vessel was on its way from Halifax, Canada to Mayport, Florida. The ship was planning a stop before continuing on its journey to its port in San Diego. Officials said the cause of the ship’s failure is still under investigation, but officials told AP it appears metal debris collected in the lube oil filter may have caused the system to break down. Sen. John McCain, head of the Senate Armed Services Committee, told the Navy Times that the problems in the Milwaukee are “deeply alarming,” as it was commissioned just only a few weeks ago. “I expect the Navy to conduct a thorough investigation into the root causes of this failure, hold individuals accountable as appropriate, and keep the Senate Armed Services Committee informed,” he wrote in a statement. Littoral combat ships are able to operate much closer to shore, while going at faster speeds.